Our team was exclusively instructed by commercial property experts Jones Lang LaSalle to create and produce all marketing particulars for the newly commissioned office scheme Charter Place – Uxbridge, London. Their office investment team wanted to create something a little special for this project in order make the scheme stand out in the market place. Uxbridge, London is home to a wide range of corporate occupiers with international companies having been drawn to the area due to its calibre of available labour, its excellent transport communication links and proximity to Heathrow airport. 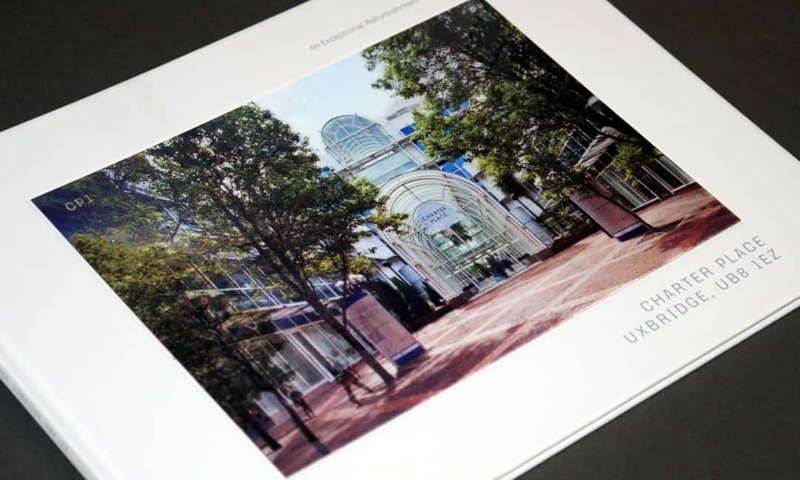 In order to best showcase what the centre had to offer, the team produced a bespoke 24 page, case bound brochure which included location photography and CGIs as well as custom drawn site and location maps. But what made this particular project extra special was the cover with the integration of a unique lenticular image showcasing the scheme pre and post development.